WASHINGTON – Former U.S. Senator Robert Joseph “Bob” Dole received a Congressional Gold Medal today during a ceremony in the Rotunda of the U.S. Capitol. Dole was presented the medal in recognition of his service to the nation as a soldier, legislator, and statesman. Bob Dole proudly served the people of Kansas in Congress for 36 years, both in the House of Representatives and in the Senate. During his time in office, he was known for his bipartisan ability to “reach across the aisle,” which was illustrated by his work on the Americans with Disabilities Act. He was also a dedicated Army soldier during World War II, receiving two Purple Hearts and a Bronze Star with an Oak Leaf Cluster for his service. He also received an American Campaign Medal, a European-African Middle Eastern Campaign Medal, and a World War II Victory Medal. Following his public career, Senator Dole became an advocate for the public good. Among other accomplishments, he served as National Chairman of the World War II Memorial Campaign, established the Robert J. Dole Institute of Politics at the University of Kansas to encourage bipartisanship in politics, and has been a life-long champion for the disabled. The medal’s reverse (tails) displays a Kansas wheat field below a quote from Senator Dole: “FOR GREATNESS LIES NOT IN WHAT OFFICE YOU HOLD, BUT IN HOW HONEST YOU ARE, IN HOW YOU FACE ADVERSITY, AND IN YOUR WILLINGNESS TO STAND FAST IN HARD PLACES.” An additional inscription includes “ACT OF CONGRESS 2017.” United States Mint Sculptor-Engraver Phebe Hemphill created and engraved this design. 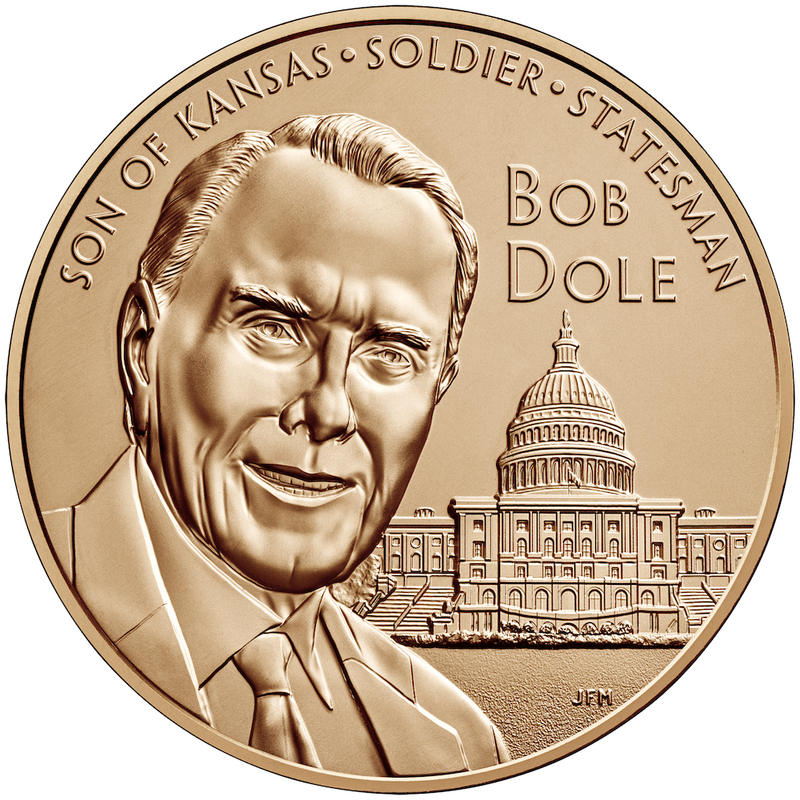 The public law that awards the Congressional Gold Medal to Bob Dole also authorizes the United States Mint to strike and sell bronze reproductions of the medal. The three-inch medal (product code 17MD), priced at $39.95, and the 1.5-inch medal (product code 17ME), priced at $6.95, will be available for purchase on January 17, 2018, at 3:00 p.m. Eastern Time through the bureau’s online catalog at https://www.catalog.usmint.gov/, and at 1-800-USA-MINT (872-6468). Hearing- and speech-impaired customers with TTY equipment may call 1-888-321-MINT (6468).